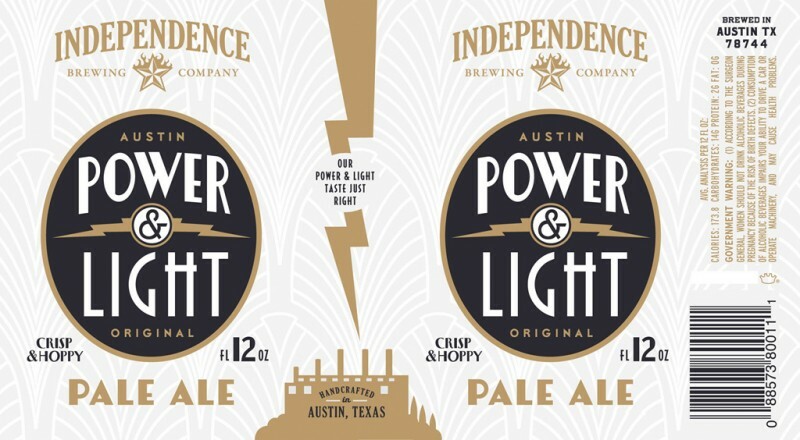 Austin, TX – Independence Brewing Co. announced today the second in its line of can releases: an updated version of its award-winning Pale Ale, Power & Light. Inspired by Austin’s iconic Seaholm Power Plant, the new design represents the brewery’s deep ties with and adoration for the city. For the newest launch, it was important for Independence to objectively select the appropriate beer that would not only suit the season but remain drinkable year-round. Power & Light features a new recipe, a notably more “stripped down” version of one of the brewery’s oldest and most popular brews, the Independence Pale Ale, and was a natural choice to launch in the peak of summer. As temperatures continue to rise, beer lovers can enjoy the new brew in a more transportable format whether sitting by the pool or grilling in the backyard. The simplified version of the brewery’s Pale Ale, which took home a 2014 Good Food Award, is a crisp and hoppy yet “sessionable” pale ale, perfect for fans of classic American pale ales as well as traditional IPAs. Taking inspiration from the unique architecture of one of the city’s most notable structures, the Seaholm Power Plant, into consideration for the design, the cans also refer to art deco design with the bold and stylized lines, Power & Light stands to be a representation of “old Austin” meeting the new. Available in a six-pack format, Power & Light can be found on shelves at select retailers including Specs, Central Market, Whole Foods, and HEB stores in Austin, Houston, College Station and San Antonio. The brew will also be available on tap at various locations throughout Texas. The release of Power & Light marks an important milestone in Independence’s evolution in the craft beer scene, the most recent being the 3,000th brew released this summer, the brewery’s first ever Lager. To celebrate the can launch of Power & Light, Independence will be hosting a series of pop-ups, social media contests and giveaways throughout the summer. Follow @indybrew and #AustinPowered for updates. Austin Amber, Stash IPA, Convict Hill Stout, Bootlegger Brown, White Rabbit White Ale, and more.